Nachi Palletizing software considerably reduces programming time and complexity by creating palletizing patterns from simple input data. Simply program a start point and part layout dimensions and the palletizing software will automatically generate a robot program. 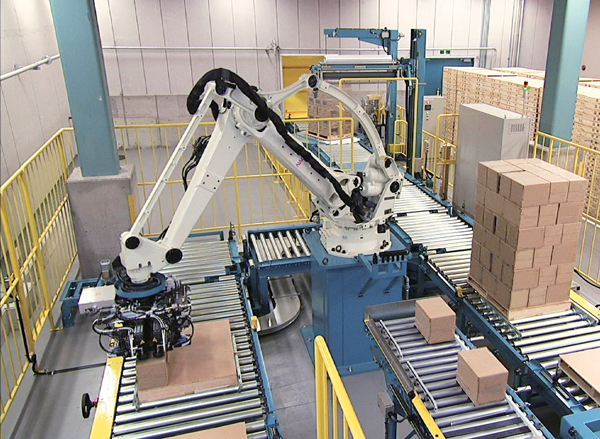 Using Nachi Palletizing software, minimal robot programming is needed to create a palletizing routine that will pick or place literally hundreds of parts. Standard and custom ("Simple" and "Highly Effective") palletizing routines can easily be created using the built in palletizing function. "Simple" palletizing software is used to stack parts with standard geometry into even rows and columns. "Highly Effective" palletizing software is used to create custom pallet layouts with many different offsets and rotation critical placement. Whether your parts layouts are simple or complex, Nachi's palletizing software can consistently and efficiently package them. Palletizing pattern software drastically reduces programming time when compared with manual programming. A large variety of goods including boxes, bags, crates, cases, metal parts, and many other goods can be palletized effectively. Nachi Robots using palletizing software can can tend multiple conveyors or machines and organize many parts simultaneously. Standard "High Speed Interference Detection" software helps prevent damage to products being handled and the robots end of arm tooling. Nachi LP Series Palletizing Robots feature "Path Optimization" software that reduces cycle time and increases throughput. Don Bosco 1478 - (9420) - Río Grande.